ICFOSS (International Center for Free and Open Source Software) is conducting a Two-day introductory workshop on Blender. 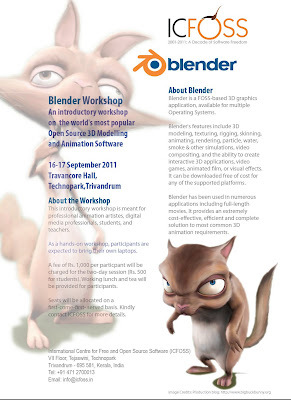 This is a great opportunity for folks to get introduced to the Blender interface , and get to model, create and render a scene completely hands-on. This introductory workshop is meant for professional animation artistes, digital media professionals, students, and teachers. As a hands-on workshop, participants are expected to bring their own laptops. A fee of Rs. 1,000 per participant will be charged for the two-day session (Rs. 500 for students). Working lunch and tea will be provided for participants. applications including full-length movies. It provides an extremely cost-effective, efficient and complete solution to most common 3D animation requirements. contact ICFOSS for more details.